An exasperating phenomena in paradise is vanishing plants. Every time you try to embellish the front of your home with lovely plants they disappear. It is discouraging that when you want to enhance your environment some kleptomaniac comes along to promptly uproot your efforts. The government, through public announcements, encourages planting and growing your own vegetables. However, there is an increase in theft of plants and vegetables from private and domestic land areas. 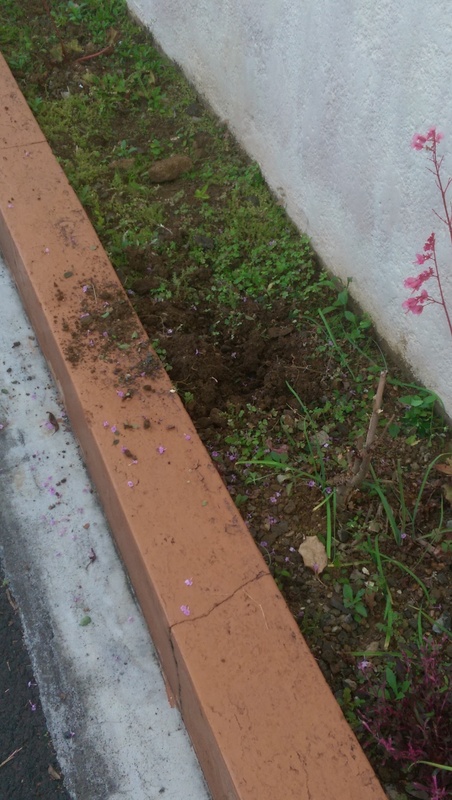 The stealing of plants in the neighbourhood is not new but is nevertheless a plague to residents. It makes you wonder if this is just a national sport or social circumstances due to growing poverty. Whatever the reasons, I find it demoralizing that adults do not respect the environment or private property. An attitude of disrespect of residents and their areas continues to be a problem. Often we have car passengers discarding packaging on the road. Regularly, a car comes to the end of our road and dumps plastic rubbish sacks on the corner. Dogs and rats often tear open these plastic sacks and the contents are spread out along the road. As a result, we have decided to enhance our home security measures and abandon the planting of colourful plants and flowers from the front of the house. Often the media reports on the sense of insecurity in the population and this kind of unsociable behaviour justifies it. so surely it is up to the authorities to get to grips with the situation. Any suggestions on that ??? I’ve never heard of such a thing except when kids get in a prank sort of phase. But, the regular dumping of trash and theft of flowering plants sounds like someone is trying to lower your property value? I know this is a long-shot, but the only time I’ve ever heard of something like this is when a developer wants the property for some big project. Apparently, quite common here, they steal your plants to resell at the local market. We sometimes think there is a poverty factor to this. However, I am told that some have seen an incident, related to an official building and its flower-bed, where a lady drives-up in a car and uproots plants, puts them in a bag and drives off. Just help yourself why don’t you! Incredible, I don’t know what to say to that! It’s so sad to hear that plants of the flower variety are subject to the irresponsible conduct and theft by others – for whatever reason. There cannot be any justifiable reason for stealing, interfering & damaging flowers whilst trespassing on anybody’s private property or indeed any other area that the public has the right to be on and who wish to enjoy that environment, which so often is substantially-enhanced by the varied colours and varieties carefully planted by the groundsmen for our enjoyment.